Jewish Agency head calls to extend Kotel with section for men and women together. Jewish Agency head Natan Sharansky has advanced a proposal to put an end to conflict at the Kotel (Western Wall), suggesting that the Kotel be extended, and a new section be added at which men and women can pray together. The Kotel has been the site of conflict as a group of women calling themselves Women of the Wall (WOW) hold non-traditional Orthodox prayer services at the site once a month despite a court order setting aside the Robinson’s Arch for their use. 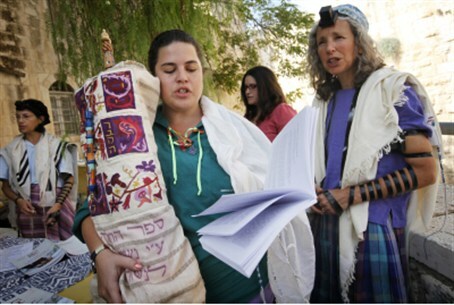 The issue of organized women’s prayer at the holy site, including the wearing of traditionally male garb such as talit and kippot, and performing Torah scroll readings, has caused controversy. Supporters of the Women of the Wall say the Kotel should be open to all forms of organized Jewish prayer, and claim that non-Orthodox streams of Judaism have millions of followers among Jews living outside Israel, although recent demographic studies show they are on the wane and have few young members. Opponents say that non-traditional prayers disturb regular worshipers and violate the standards of decorum at the site, which are based on Jewish tradition dating back thousands of years. They cite that none of the Jews who immigrated to Israel in the tens of thousands from all corners of the globe with varied prayer customs has ever requested a change in Kotel tradition. In fact, the Supreme Court ruled in favor of respecting the traditional rules and allotted an area near Robinson's Arch for the WOW prayers, but the women continued to insist on provocative behavior at the Kotel Plaza itself each Rosh Chodesh (start of a new Hebrew month). Robinson’s Arch is, like the Kotel, part of the remnant of the retaining wall around the Temple Mount, the area believed to also contain the site of the "holy of holies" of the Temple. Nevertheless, the Women of the Wall have continued to stage public prayer sessions at the Kotel, claiming Robinson’s Arch is exclusionary. Sharansky has suggested the government improve the situation by physically joining the Robinson’s Arch to the Kotel Plaza and changing its name, thereby making it a more palatable prayer site. The Jewish Agency director pointed out there is no need to call the ancient site by the name of a British archaeologist. He also suggested expanding it. Under Sharansky's plan, the current prayer areas at the Kotel -- one for men and one for women -- would remain as they are today. Yesh Atid MK Aliza Lavie is active in trying to find a mutually agreed-upon solution for the Kotel controversy, and assisted Sharansky in creating his proposal. “It’s clear that we must change the current situation, where the Kotel, which should be a symbol of peace, has become the site of regular conflicts and clashes,” she said. Sharansky’s proposal would be “an inclusive solution that will allow anyone who wishes to do so to come to the Kotel plaza,” she said. Lavie called on all parties involved to demonstrate calm during prayers this week marking the beginning of the Hebrew month of Iyar. “Don’t add fuel to the fire,” she requested.